Stress Manager - Put stress to rest! 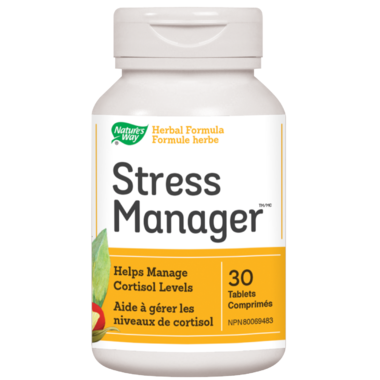 This herbal formula helps reduce the symptoms of stress such as fatigue, sleeplessness, irritability and inability to concentrate. Directions: Adults take 1-2 tablets daily. Consult a health care practitioner for use beyond 6 weeks. For prolonged use, consult a health care practitioner. Microcrystalline cellulose, dextrose, croscarmellose sodium, stearic acid, polyvinyl alcohol, magnesium stearate, titanium dioxide colour, macrogol, silica, talc. Do not use if you are pregnant or breastfeeding. May cause heartburn, shaking hands, perilabial numbness, sexual dysfunction and thyroid dysfunction. Some people may experience drowsiness. Exercise caution if operating heavy machinery, driving a motor vehicle or involved in activities requiring mental alertness. Consumption with alcohol, other medications or natural health products with sedative and/or analgesic properties is not recommended. If dizziness, vomiting, dry mouth, thirst or nosebleed occur, discontinue use. If symptoms persist or worsen, or if new symptoms develop, consult a health care practitioner. If you are taking any prescription medication, if you suffer from any psychological disorder and/or condition such as frequent anxiety or depression or if you have diabetes, a kidney disorder, or blood pressure problems, consult a health care practitioner prior to use.